UNWIND! is what you get when you combine the principles of Stephen R. Covey’s 7 habits with that of mindfulness and stress reduction. Sound good? It is! Before launching into their 7 paradigms, the authors do speak to the power of mindfulness, which I love. I am surprised, though, that the authors didn’t really speak to the power of sleep, which Arianna Huffington used to combine with mindfulness and meditation in her book THRIVE. I can testify to the power of each shift of the mind; these things WILL make you less stressed and more capable. The benefits are more than just health. You’ll actually find yourself getting more things done, and get those things done in a more organized, more thought out, better way. 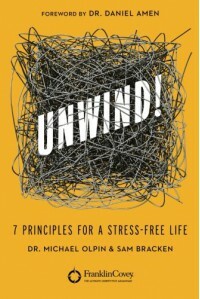 The authors claim that many other books pick apart the “limbs” while this book strikes at the “root” of stress. I’m not so sure those others books don’t accomplish the same. Yes, many “self-help” books may skirt around the issues, but if you’ve already been reading about mindfulness or have been faithfully following Covey’s 7 habits, you may already be ahead of the game. I would recommend this book to anyone looking to find that balance in life and find the tranquility they desire. Thanks to Grand Harbor Press and Amazon Publishing for sending me this book for review.